There were 451 press releases posted in the last 24 hours and 153,526 in the last 365 days. Juana and Magdalena share Neri’s love, they both know that this situation is hurting them. Critically acclaimed drama Black Mexicans / La Negrada by Jorge Pérez has recently been acquired by Artmattan Productions! "Black Mexicans" / "La Negrada" is the first Mexican feature film about the Afro-Mexican community, filmed entirely with people from different towns around the Costa Chica in Oaxaca. 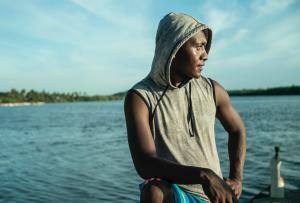 Among the black people in the Costa Chica in Oaxaca, it is socially accepted that a man lives with more than one woman. Juana and Magdalena share Neri’s love, they both know that this situation is hurting them. Juana will have to die in order to show Magdalena a new path for her life. "The social realist drama marks Pérez Solano’s third feature, after a diptych, 2009’s “Spiral” and 2014’s “La Tirisia” (“Perpetual Sadness”) both of which examined in a naturalistic style the fate of those left behind by men’s immigration to the U.S. In Mexico, the afro communities represents only 1% of the total population. They have never been recognized as an ethnic group, nation or culture, suffering discrimination as an outcast group. LA NEGRADA is the first Mexican fiction movie filmed entirely in one of those black communities, with local people, no professional actors. An effort to give them voice and make them visible. ArtMattan Films is a film distribution company that aims to present more varied choice of films depicting the human experience of people of color in a context different from the usual museums, cultural centers and universities to which these films are traditinonally relegated. With no intention of defining a canon, the films in the Artmattan catalog are as diverse in genres and styles as any contemporary artistic expression can be. From the strong "Faraw!, mother of the dunes" by Malian filmmaker Abdoulaye Ascofare to the joyous "Journey of the Lion" by Fritz Bauman, these films are snapshots to the incredible range of the lives of people of color whose life and place in history have been marked by a distinctive sign: the color of the skin. These films have enjoyed acclaim in different festivals all over the world including the African Diaspora Film Festival. They are components of a movement that has created a strong and diverse cinematic body of work.